Spurs forward Kawhi Leonard is nothing less than a superstar whose approach belies his true ability. Kawhi Leonard is nothing less than a superstar. On this point there can be no debate; the definitive best player on a team screaming toward 69 wins earns the distinction almost by default, and any doubt of Leonard’s qualifications can be erased with even a game’s worth of film. To see Leonard strangle the life out of opponents’ sets and consistently manufacture the means to score is to know his dominance. Yet that word—“dominance”—is one that characteristically escapes the standard, practiced discussions of Leonard’s game. His defense is praised, even revered. His offense is admired for its progress. There’s a disconnect, though, that seems to separate Leonard in public regard from the likes of Stephen Curry, LeBron James, and Kevin Durant. There’s no reason for it. Leonard has been the second-best player in the league this season while offering a master class in the power of restraint. Nothing is wasted in Leonard’s game. His current turnover rate (7.4%) is one of the best in the league, occupying a statistical space reserved largely for spot-up shooters and single-minded gunners. Leonard has seemingly merged those archetypes into something far more profound: A star who is both creator (given his elite efficiency in isolation situations) and destroyer (as a league-leading 50% shooter on three-pointers) without bothering to succumb to the limitations of either distinction. There are players who can shoot nearly as well as Leonard has, yet few who could also be trusted to generate offense if the situation called for it. Even among that tiny, intersectional group, none are so careful with the ball. The trinity of efficient shooting, low-turnover play, and creative capability makes Leonard a genuine anomaly—an offensive star unlike any other in the league. Perhaps this is why Leonard’s star seems slower to rise in the public eye than it should. The national conversation surrounding great players is almost always rooted in history. Kobe Bryant courted—and then lived in—comparison to Michael Jordan. Whether LeBron was closer in style to Michael or Magic Johnson was a matter of public debate. Durant drew comparison to George Gervin, Kevin Love to Wes Unseld, Dwight Howard to Shaquille O’Neal, Chris Paul to Isiah Thomas. Breakout players are first contextualized in points of reference before they’re allowed to become themselves. Leonard, as a mid-major enigma turned 22-year-old Finals MVP turned Defensive Player of the Year turned traditional superstar, has no convenient template. The best do-it-all wings in NBA history did it all in different ways—the most notable distinction being that Leonard isn’t the passer that many of them were. That plays into his low turnover rate, to be sure, though in a broader sense it creates a stylistic divide between his own game and our cultural etchings of wing versatility. The range of Leonard’s offensive skill is simply applied in different ways. A vicious post-up game has allowed Leonard to bully the only defenders quick enough to stay in front of him. A tidy pull-up game demands honesty of his defender, then punishes them with physical advantage. Leonard is aces in isolation (where in 56 possessions he has scored 62 points and committed zero turnovers, per Synergy Sports) but not tethered to it; the way Leonard moves around the floor makes his touches all the more unpredictable to opposing defenders. He runs the pick-and-roll game to Spurs-ian standards, spaces the floor with the best of them, and runs hard to turn as many transition scenarios as possible into easy scores. Leonard’s stardom may actually be quieted by the fact that he does too much to have a trademark. in the first fan balloting returns for the All-Star game, making him the fourth-most voted Western Conference forward and the ninth-most voted player overall. In the second set, Leonard held in the fourth spot but saw Draymond Green leapfrog him into third among West forwards. He now trails a starting spot by a mere 1,294 votes. The reality, though, is that we still have a long way to go in capturing the quality of truly unique players—particularly those who excel on defense first. 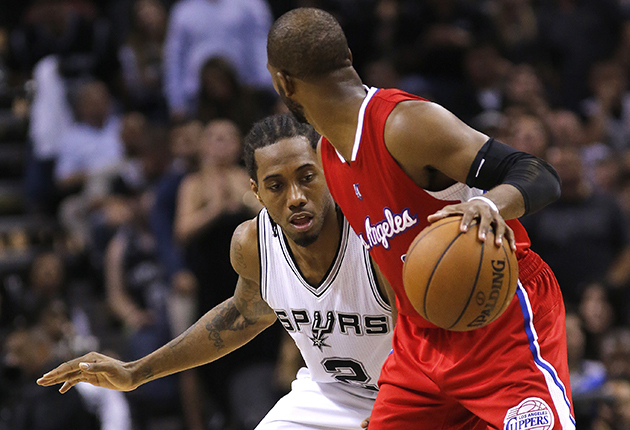 Leonard should have something of an advantage as a lockdown artist who racks up steals in high-profile matchups. He makes the best wing players in the league fret. The weight of that matters, and yet Leonard’s play for a historically dominant team never seems to resonate as it should. Leonard doesn’t have to be beloved, and with as stoic as he is in a league driven by personality, that may well be impossible anyway. What he’s done this season, however, can and should be admired by basketball fans everywhere. Leonard’s defense is as obvious as defense gets; go-to scorers give up the ball rather than work against him, drives are blanketed from the start, shot attempts are snuffed out completely, and guards hesitate before even throwing passes in his general direction. His offensive prowess, too, has only grown clearer with time. Leonard is an emerging giant, and he has no burden of proof left unfulfilled.